The white supremacist group Identity Evropa more than doubled the number of its chapters. The violent neo-Nazi organization Atomwaffen Division grew from one chapter to 27. The white nationalist group and podcasting site The Right Stuff boasted 34 chapters. American hate groups had a bumper year in 2018 as a surge in black and white nationalist groups lifted their number to a new record high, the Southern Poverty Law Center said in a report issued Wednesday. The Alabama-based legal advocacy organization recorded 1,020 active hate groups last year, up 7 percent from 2017. The previous record tallied by SPLC was 1,018 in 2011 amid a white extremist backlash against the presidency of Barack Obama, the nation's first African-American president. The increase was driven by growth in both black and white nationalist groups, the SPLC said. The number of white nationalist groups jumped from 100 to 148, while the number of black nationalist groups — typically anti-Semitic, anti-LGBTQ and anti-white — rose from 233 to 264. The SPLC defines a hate group as "an organization that, based on its official statements or principles, the statements of its leaders, or its activities, has beliefs or practices that attack or malign an entire class of people, typically for their immutable characteristics." The number of hate groups has grown every year for the past four years, the SPLC said, a 30 percent increase roughly coinciding with President Donald Trump's election campaign and presidency. The increase followed three years of decline toward the end of the Obama administration. Hate crimes have followed a similar trajectory in recent years. After falling for three consecutive years, attacks on blacks, Jews, Muslims and other minorities increased by 30 percent in the three-year period ending in 2017, according to the latest FBI data. The uptrend continued into last year, with hate crimes in America's 30 largest cities surging by an additional 10 percent, according to the Center for the Study of Hate and Extremism at California State University, San Bernardino. The majority of hate crimes are nonviolent, but some incidents were deadly. White supremacists in the U.S. and Canada killed at least 40 people last year, up from 17 people the year before, according to the SPLC's tally. While most bias-motivated offenses are not committed by members of hate groups, the perpetrators of hate crimes draw inspiration from ideas put out by hate groups, said Heidi Beirich, director of the SPLC's Intelligence Project and author of the report. Beirich blamed Trump's anti-immigrant and anti-Muslim statements and policies for heightening deep-seated white nationalist fears of an impending white-minority country. 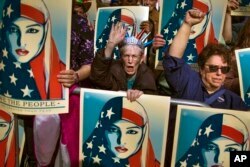 FILE - In this Feb. 19, 2017 file photo, people carry posters during a rally against President Donald Trump's executive order banning travel from seven Muslim-majority nations, in New York's Times Square. The U.S. Census Bureau estimates that more than half of the nation's children are expected to be nonwhite in 2020, while the U.S. population is slated to become majority-minority in 2044. "Rather than trying to tamp down hate, as presidents of both parties have done, President Trump elevates it with both his rhetoric and his policies," Beirich said. "In doing so, he's given people across America the go-ahead to act on their worst instincts." Black nationalist groups, which advocate separate institutions or even a separate nation, made up about a quarter of hate groups tracked in 2018. But the SPLC said the black extremist groups "lagged far behind the more than 700 groups that adhere to some form of white supremacist ideology," the report said. Among white extremist groups, the SPLC counted 112 neo-Nazi groups, 148 white nationalist organizations, 63 racist skinhead groups, 36 neo-Confederate outfits and 17 Christian Identity organizations. But not all white hate groups thrived last year. 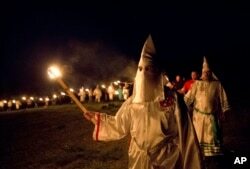 The number of Ku Klux Klan (KKK) chapters fell for the third straight year, dropping to 51 in 2018 from 130 in 2016. FILE - Members of the Ku Klux Klan participate in cross burnings in rural Paulding County near Cedar Town, Georgia, April 23, 2016. With its outdated traditions and penchant for white robes, the KKK, the nation's oldest racist organization, has failed to appeal to young white tech-savvy racists, the SPLC said. "It may be that the KKK, having somehow endured since 1866, is finally on its last legs," the report said. The SPLC started tracking KKK chapters in 1987 and later expanded its list to include other hate groups. In recent years, as it has put new groups on its list, including anti-Muslim, anti-immigrant and anti-LGBTQ organizations, conservative groups have accused the SPLC of unfairly labeling them. Last month, the Center for Immigration Studies sued the SPLC in federal court in Washington for "falsely designating" it as a hate group in 2016, saying the SPLC has produced no evidence that the group maligns immigrants as a class. Beirich said the SPLC is standing by its hate group listings.